Lois McMaster Bujold's sci-fi/space opera book series The Vorkosigan Saga is at the very top of my list of favorite works of fiction ever. Each book is a combination of a sort of whodunnit related to intergalactic political intrigue and intense personal reflection on the part of the main character. Bujold is a master of both. Miles Vorkosigan, the main character for most of the series, is sharp as a tack. He runs circles around everyone else while simultaneously learning life's hard lessons and overcoming a series of physical disabilities. I really like Miles; Bujold is so good at writing characters that you actually know him well enough to really like him and to know how he thinks. 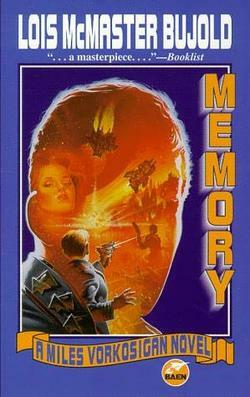 My favorite of the series is the book Memory, in which Miles, at age 30, is forced to make a sudden and unexpected career change. Things seem to be going pretty badly for him, but they suddenly swing in a much more positive direction when he is appointed by the emperor of Barrayar to be an "imperial auditor". The imperial auditors are a small and elite group of highly trusted people with varied expertise who investigate things on behalf of the emperor and have the authority to speak with the emperor's voice in situations where consulting the emperor would take too long (like when he's halfway across the galaxy). The title invokes instant respect and some amount of nervousness from any Barrayaran familiar with the position, but most outsiders have no idea what Miles actually does (which can work to his advantage). For example, in Cryoburn, a young friend of Miles mistakenly assumes he is some kind of insurance claims adjuster. It sounds kind of boring, but it isn't (nothing Miles does is boring). It typically involves narrowly saving the future Barrayar (or the entire galaxy) from assured destruction or uncovering and tidily dealing with some outrageous plot that was spiraling out of control. Energy audits can be done with varying levels of detail. My energy audit was a quick, general audit to measure the energy efficiency of my house and to identify ways to improve it. For example, they measured the rate of air turnover in the house by doing a blower door test, but they did not use an infrared camera to identify exactly where the air leaks were (which, in retrospect, would have been more useful). They also inspected all the duct work and measured the amount of airflow coming from the ducts. After the on-site audit, they followed up with an hour-long phone consultation to go over the results and make recommendations. They were very helpful in explaining everything and very good about answering questions. For item 1, they noted that the house was less drafty than most of similar age (perhaps due to my window weathersealing? ), but they did not have specific suggestions except replacing windows altogether and getting one of their guys to crawl around in the crawl space and caulk things. I really wish they had identified specific places where the air leaks were coming from (besides the obvious places I know about, like the window bottoms) because then I would know exactly where to focus my efforts. Ah well. If nothing else, I'm inspired to try again to figure out how to seal the bottoms of the windows, and I might consider replacing the kitchen and bathroom windows, which are kind of horrible and not original anyway. For item 3, they noted that the air intake for the HVAC system is undersized. They also found that there was some leakage in the duct work and that the air wasn’t distributed optimally. They would be happy to re-do all the ducting for $4000. Uh, no thanks. It’s not worth it given what I pay in utilities (practically nothing). I will ask my HVAC people to check the duct sealing next time they come to service my equipment, though. Ultimately, I don’t think this audit really told me much I didn’t know already. I already knew the house was drafty and poorly insulated. Now I have specific numbers to back it up, and I also have some possibly-useful information about the exact age and models of my HVAC equipment and a more accurate square-footage measurement of my house. Blahhhhh. Maybe I should give up on this old house and take up residence on a space station somewhere (preferably not a drafty one).